Over 2 Days Offline - I'm Back! I'm back! Boy, I hate to say it, but I depend on the internet more than ever. Wednesday I was off work for a medical procedure (befitting my latest age milestone), and that afternoon I had internet one minute and not the next. After calling the ISP, they could see we could send and receive but there was no internet there for us. 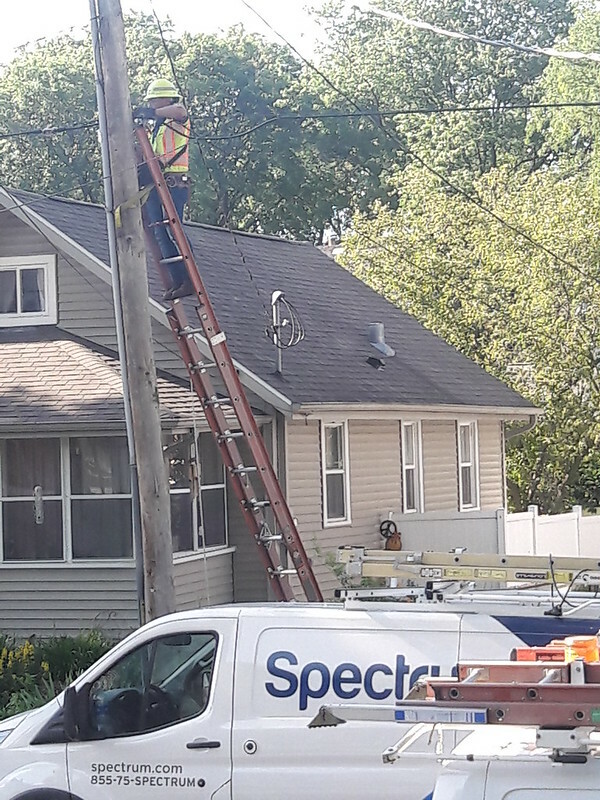 Tonight a couple technicians came out, and after replacing some cables, connections and splitters, and also doing the same on the pole outside (seen here), we have internet back. They don't even know what fixed it, but it's working again and I'm happy. When I was young I used to know the television schedule for all 3 channels and what I liked every night of the week. These days I read and watch what I choose on the internet and mostly use the television for news in the mornings, sports events, and just for background noise. Plus, we have the living room lights, Petcube and Alexa gadgets that we use - all dependent on the internet and wifi. We've had our phones, but it isn't nearly the same and uses up data, so it's good to be back in the 21st century! Another thing to note, my wood rack arrived today. I bought an 8' by 4' rack to hold a face cord of split firewood. I have to put it together and plan on placing it between the lilac area and the tree stump area along the fence line by neighbor Dave. Once complete, I will order a face cord of mixed hardwoods from a place I found for 150 bucks, delivered. I still plan on scavenging wood to burn, and have already done so, but buying some firewood will make that urgency much less and we can have a fire, big or small, whenever we like without worrying about running out of wood or overpaying for small bundles at convenience stores. This will just make for more relaxed and better fire pits, and that is just as it should be. But not tonight, after the hottest day of the year so far! Sunday we got out on Terry's boat for the first time this season (thanks Terry!). It was a beautiful day out, bright and sunny though some clouds moved in later. Not soon enough for me as I got a little more sunburned than I expected. I was hoping to get a little color so took it easy on the sunblock and by that evening had turned a nice lobster color, especially my arms. 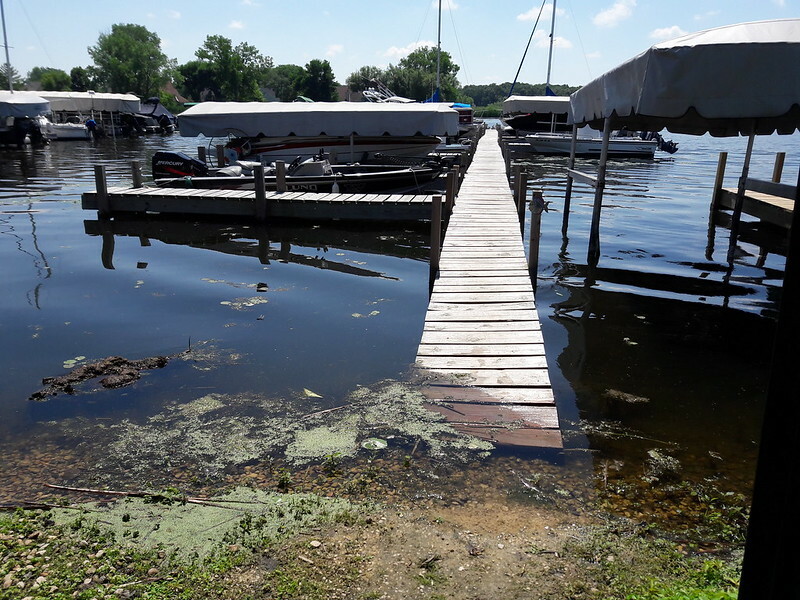 The water is high on Madison's chain of lakes, but there was not a 'no wake' rule on Lake Mendota like the other lakes, I've heard. I don't feel like writing a whole lot right now, but as always, I took lots of pictures, the best of which are after the break. Do come take a look, but mind your step! Just because it was so nice. The first One Minute Of Peace here. Thursday morning it was on the news that Olbrich Botanical Gardens had another corpse flower that was ready to bloom. Yesterday morning they reported that it was in peak bloom, so while at work I decided I would stop by on the way home to see it and, of course, get pictures to share here. I hear of this every few years, and they do have 4 of the plants so that makes sense because they only bloom every 7-10 years, I've just never taken the time to go see it before. 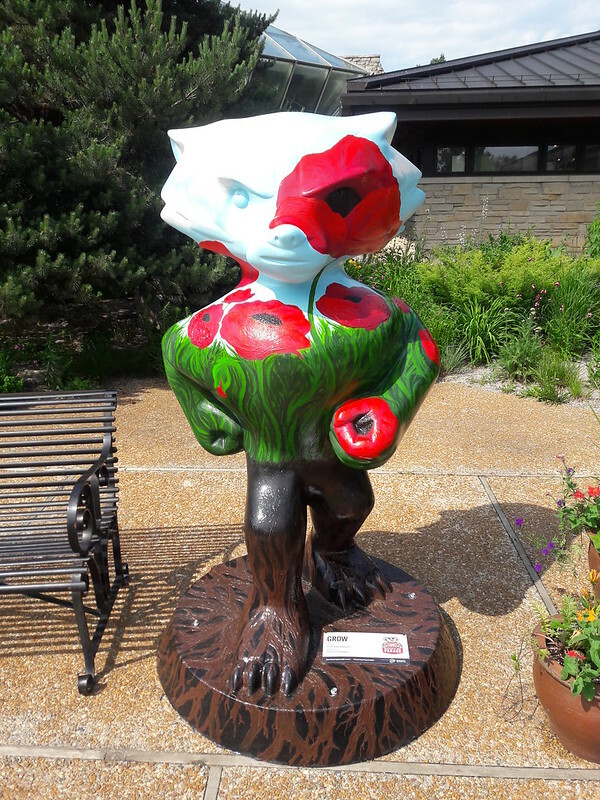 As I mentioned earlier, Olbrich has one of the 4 Buckys that are nearby so, while I had momentarily forgotten that fact, I couldn't miss it outside of the Bolz Conservatory, where the big stinky flower was. This Bucky is simply titled 'Grow,' which is apt for where it is. That's 3 Buckys down and only 82 more to go! Realistically, we'll just have to wait and see how many I 'collect' by summer's end. The next one will most likely be across the street from here at Olbrich Park. Speaking of which, we have not been to the biergarten yet this year, but have heard that it is really very popular this summer. Taken from Olbrich's website: Amorphophallus titanum (Titan Arum), also known as the Corpse Flower, will only bloom four to five times during its 40-year life. Titan Arum are best known for their unpleasant odor - comparable to rotting meat. 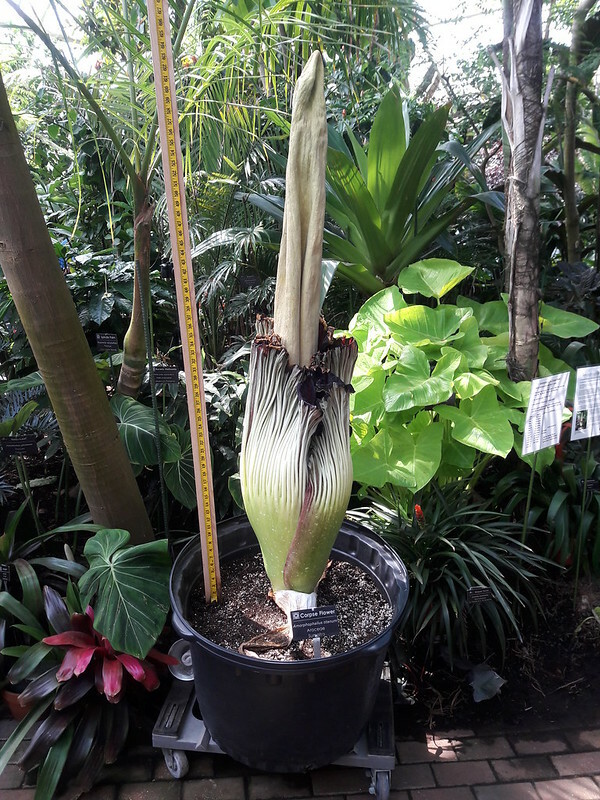 This particular Corpse Flower, affectionately called Mori (which is the Latin word for "death") is an offspring of the Big Bucky Corpse Flower at UW-Madison, and last bloomed at Olbrich in 2009. The flower will only last a few days before it closes. When I arrived there was hardly a place to park. I was hoping to beat the after work crowd but there was people everywhere, mostly in the display and gift shop areas. It was a two dollar donation to get into the conservatory and the lady informed me before I paid that the bloom had closed about a half hour beforehand. No matter, I was there so I was going to go see it. Thankfully there wasn't the lines like she said was there during the day and the day before that so I was able to pretty efficiently get in, see it, smell it, get some good pictures and be on my way in about 15 minutes or so. I have been in the conservatory before but it has been probably since the early to mid 90's, shortly after the conservatory was opened if I remember right, I've been outside in the gardens a little more often. This visit was a good reminder to get back sooner, and we really have no excuse with it being easily within biking distance. And in wintertime the conservatory would be a great place to go when you're missing summer. I managed to take quite a few pictures in that short amount of time so there's lots more to see after the break! No, I'm not going to post every time we ride bikes down to the food carts on Wednesdays. Yes, I may post about each Bucky I 'collect.' The good news for you is that there's only 4 of them within a short riding distance, then I'd have to branch out and go downtown and all across the city and county. Yesterday we rode our bikes down to Jackson Street Plaza again for dinner. I took a video on the ride, but more on that later. Friends Josh and Casey (and cute little Mabel!) came over for a fire pit briefly last weekend and we were going to meet them at the plaza last night but they had other important things come up, so maybe next time. No worries, we'll most likely go down there every Wednesday the weather allows this summer. We arrived shortly after it was supposed to start and there were only two of the scheduled four carts there, and while we waited a bit no others showed up. Last week there were only three of four, so I was a bit disappointed again. 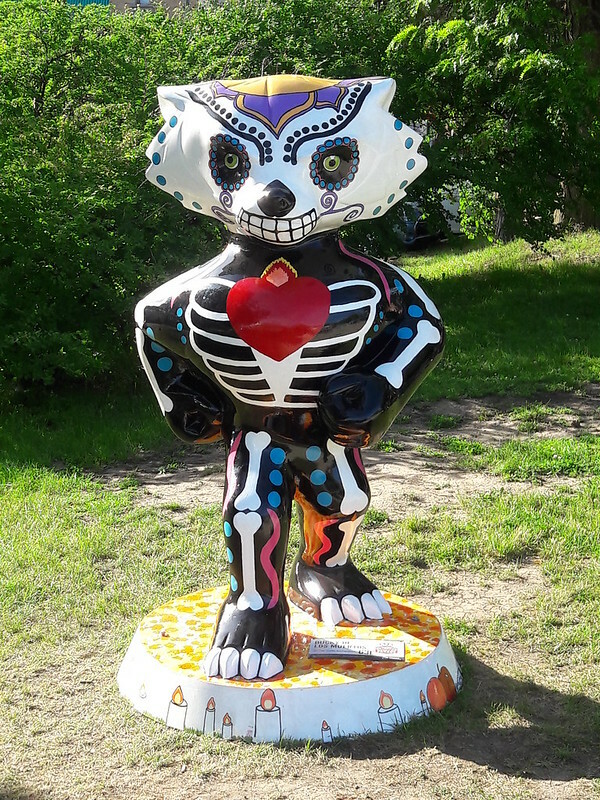 It was still pretty quiet when we arrived so I went a couple blocks further and got a few pictures of 'Bucky De Los Muertos' (Bucky Of The Dead) near Monty's Blue Plate Diner on Atwood Ave. A cool design, and maybe a little easier on the eyes than the Bucky by the Goodman Center. Here's the link to them all again, this time directly to the Bucky Interactive Map. Sometime I'll have to make the ride all the way downtown to the capitol square. I could easily get another 12 or 18 more Bucky's 'collected' on that bike ride, but then I may need to cab it home. I say 'easily' but downtown on the isthmus may be the hilliest part of Madison. I'm thinking we should get a bike rack for the car, then we can drive closer to ride, or else Kate can come pick me up when my legs run out of gas. But for now we were at the plaza with Jakarta and Soho, two very Asian-American food carts and I've never been partial to Asian food. We wound up crossing the street and having dinner at the Harmony Bar and Grill where I got a burger and fries. Not a big deal as there are lots of restaurants in that area that we wouldn't mind eating at, including the aforementioned Monty's. Earlier this spring I got a cell phone holder to put on my handlebars. I usually put my cell phone in the basket but I'm always afraid I'll forget it there - and have in the past. It holds it fairly firmly like you would need for navigation or something, but this time I straightened it up and took video of the ride from our house to Atwood, about six minutes is all the ride is per the video. It's a vertical video - which I hate - and a crappy camera on my phone, so the video isn't the easiest to watch but it's the best I can do without getting a go-pro camera or something. I started down the sidewalk because a car was coming down the street. After we crossed the first road we passed a neighbor, Lucky, but I'm not sure she recognized me when I said hi. I purposely swerved the bike a few times to get things on the side of the path, like the splash pad at Goodman and the food carts when we arrived. Have a look if you wish, but be warned - it is vertical, bumpy and the camera picture is wavy. Delcatto, maybe it will inspire you to get your bike going! There's a few things I want to touch upon today and a few pictures I want to post so, once again, it's time to start typing and see what comes out! First off, I took the above picture last night down the bike path by Atwood Avenue at the Jackson Street Plaza. Wednesdays are food cart night there this summer so we stopped down for dinner. We chose Slide this evening, and will try the others as we go. It didn't take much to fill us up, especially knowing we had to ride home. Hidden in the back middle is the Chocolate Shoppe ice cream shop, what could should be a destination any day of the week this summer! 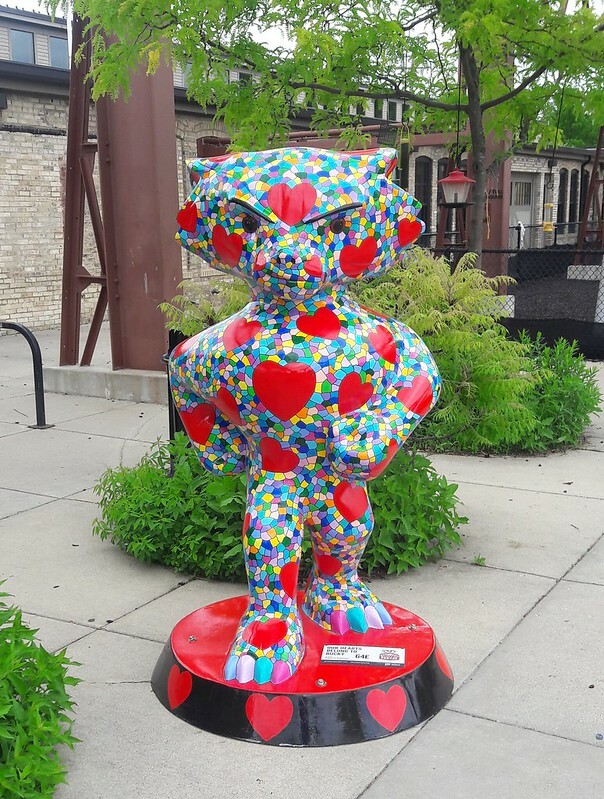 Speaking of riding bikes, I got out for a ride last weekend and got a picture of one of the 85 decorated Bucky Badgers that have been placed around Madison and Dane County. You can see them all at this link. This one, called Our Hearts Belong To Bucky, is at the Goodman Community Center. Most of them are downtown and on the near west side, on the University of Wisconsin campus, but I hope to run into a few more around town by summer's end. If you missed it, I commented two posts ago and updated my last post about my computer. I tried to fix it and failed. There's nothing left for me to do but to wait for Microsoft to ship a fix, and I do hope they will. I'm still dumbfounded that I've seen nothing on the news about this buggy update. My computer was 4 years old so while I considered taking it to a place to have fixed I ultimately decided I'd rather spend my money on a new computer. I went to Walmart, of all places, because I'd heard that was actually a good place to get a computer - and I have a huge aversion to big box Best Buy. I wound up getting a computer with specs very close to what I had for only $240. Twice what it may have cost to have the old one fixed, but it will also last years longer, I'm hoping. Getting a fix for the old one will just make it a back-up now. Where's the public outrage? Where's the communication from Microsoft? I'm still very irked. I got my second shot in back this morning since the first one about two months ago. 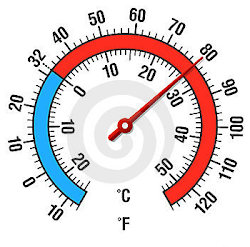 I have seen pretty steady improvement over the last several weeks, enough to consider postponement, but woke up feeling like a knife was sticking out of my left rump again yesterday. Best to get it done and see if it gets me fully back to my normal state. 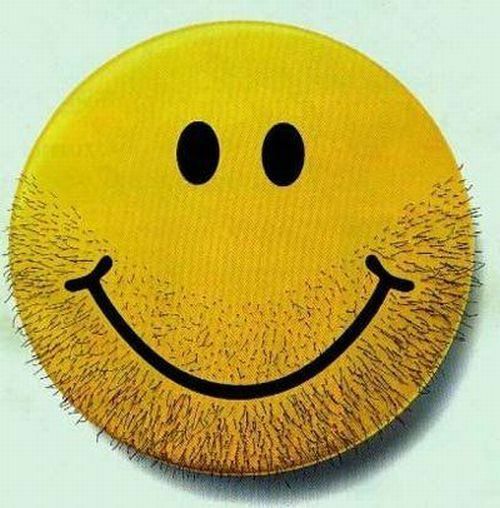 If this has little to no effect then my only realistic option is to live with it, as long as it stays manageable. 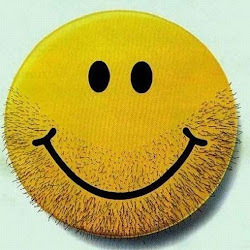 Presently, it's just not enough discomfort to justify cutting into my lower back for a third time. It may take several days until I feel the full effect from this shot, however, so fingers crossed. 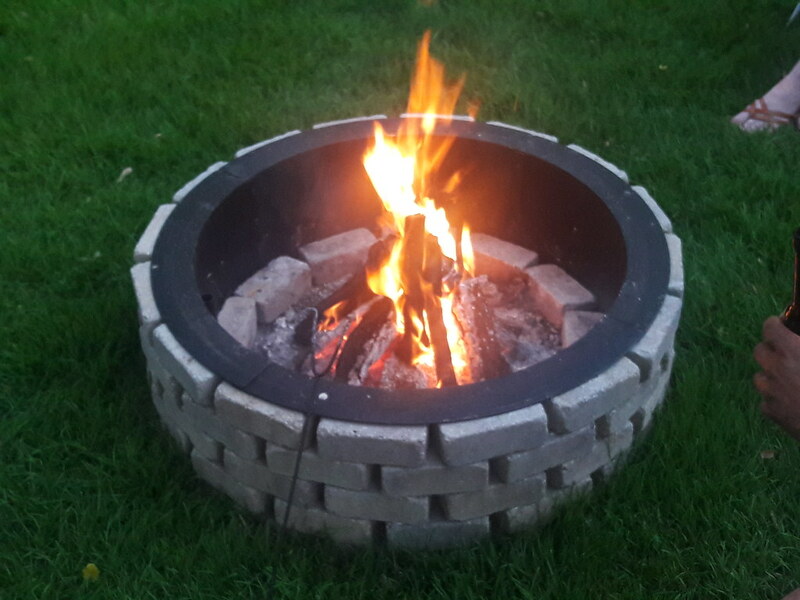 The fire pit is absolutely wonderful! I really like having it and now find that I'm wanting a fire every weekend the weather allows. I got out the chainsaw last weekend and cut the wood that I had stored from last fall and, well, I'm going to need a lot more wood. With the old fire pit it might have been enough since it was a smaller size and a bigger deal having one. Now, with the convenience and larger size, I may have to buy bundles of wood as we go this summer. I've already put the hand saws in the car for scavenging but I've not see a lot of usable wood by the curbs yet this year. That's good for now, but I hope to post another yard tour over at the garden blog yet today. When I get that done there will be some blue words in that last sentence, click it! 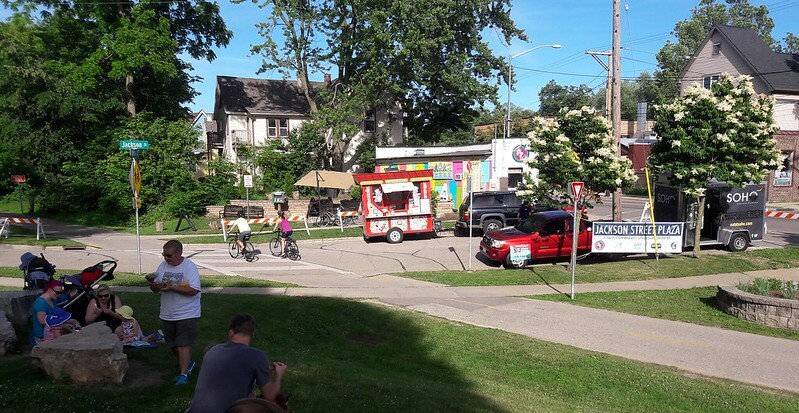 There's also the Marquette Waterfront Festival happening this weekend so we may ride our bikes down there and enjoy some good food and music. If you're here in town and not busy you're always welcome to inquire if we'll be having a fire on the weekends. It's real easy to do now, and if you bring a bundle of wood you will be heartily welcomed! 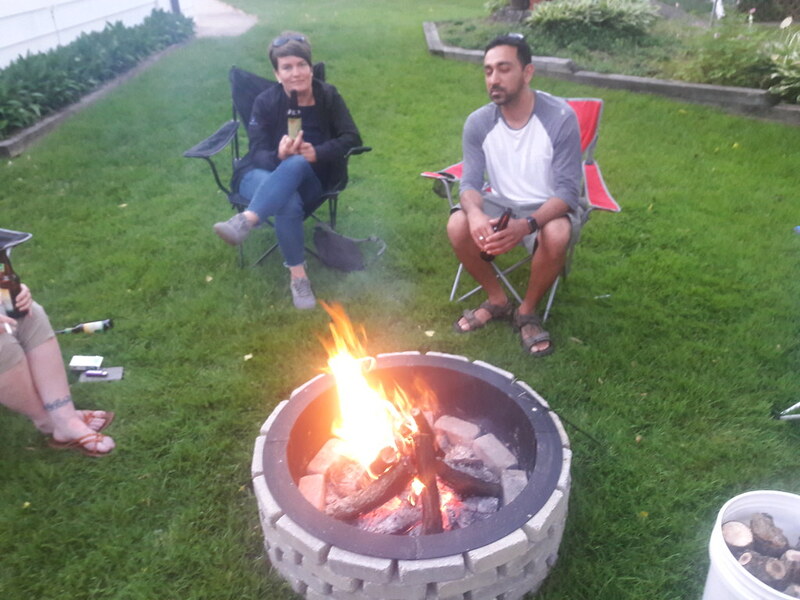 We had a very nice evening last night, officially breaking in the fire pit with friends Bridget and Zubin. We were going to have a fire no matter what, but I put the word out just a day before and most people were busy except the busiest couple we know! Thanks for coming over, guys! The mosquitoes have been horrendous this year, and supposed to only get worse. I sprayed repellent with the hose all over the yard and even sprayed myself with the regular spray. They weren't too bad early, the breeze was a help I'm sure, but I did get bites later in the night. Usually we have some time in the spring before they start hatching - not this year. 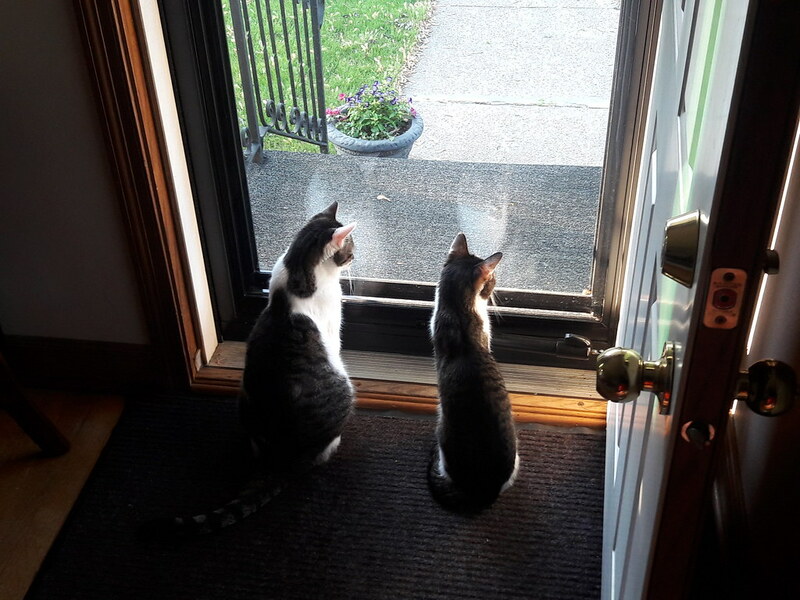 Also yesterday, I got a few good pictures of the cats and how they've been enjoying the new view with the new storm door. 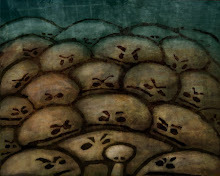 They haven't made a break for it yet, but I have a feeling one of these days one is going to bolt when the door is opened. I don't know what they'd do when they get outside and I bet they don't either. I still have to address the old computer, but with a new one the urgency is less. I might get to it tomorrow and if I do I'll post an update. *Update 6/4: As noted in the comments of the last post, yesterday afternoon I tried the second fix in the article linked in that post and, surprise, it didn't work. Not only did it not work it ruined the thumb drive I used, it's no longer formatted and won't let me format it. I'll have to wait for Microsoft to ship a fix for the computer.